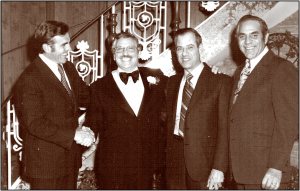 H. Betti Industries was founded by Humbert Betti, in 1934, when the Greenwich Village restaurateur and tavern owner started operating jukeboxes in both his own business as well as other nearby taverns. Humbert was already something of an international success; the South American native was raised in Italy and emigrated as a young man to England, where he launched a successful chain of ice cream parlors and raised a family (including two daughters and four sons who worked in the business, Bert, Hugh, Eddie and Louis) with his wife Catherine. Once launched, the jukebox operation also thrived, and the family moved away from running the Village restaurant and bar to running jukeboxes and amusement equipment in others’ locations, mainly in New York City and New Jersey. At its height, the Betti route had over 7,000 pieces of equipment on the street. When Humbert Betti retired in the 1950s, he returned to Italy, leaving his son Bert in charge of the route. During that same period, H. Betti & Sons, as the company was known at the time, also began supplying components, including slate, for bumper and six-pocket pool tables. The new division was known as Eastern Novelty, and its efforts were aided in no small part by Humbert’s relationship with several Italian slate quarries. Eastern Novelty is known today as Imperial, which supplies a universe of billiard and other amusement related goods, including NFL, MLB and NHL branded items, for consumers. By the late 1950s, the family had begun equipment distribution, handling first the Fisher pool table line and then later games from Midway, Chicago Coin and others. The newly christened Betson also took on Rock-Ola jukeboxes as a sub-distributor for another dealer. For the next 60 years, Betson Distributing grew across the country, becoming the dominant distributor in the amusement industry. Betson has enjoyed steady growth largely through acquisition of other dealers including Runyon Sales (New Jersey), Portale Automatic (California), Eastern Music (Pennsylvania), and Spirit Distributing (Texas). Betson has also grown by establishing new offices in various locales around the U.S. including New England, Georgia, Florida, Illinois and Utah. Today, Betson covers most of the U.S. in one way or another. Along the way, Betson has also forged partnerships to provide proprietary product from game developers like Elaute, Chicago Gaming, Jennison Entertainment and Raw Thrills/PlayMechanix. Today, Betson is the leading distributor of amusement and vending equipment in North America.